While Art Basel Miami Beach gets big billing, there is a lot more that happens in Miami when the art world converges during the first week of December. This is an important time for art consultants….we are face to face with galleries and artists from all over the world – we’re working with clients to identify works and artists that fit their collections – we lead tours – we’re doing research for future projects and engaging in the never ending process of educating ourselves. The PBS Newhour captured the experience well and we were pleased to be part of their excellent report. Follow along in this blog post to see highlights of our week. At UNTITLED in the Jungle Lounge designed by artist Daniel Gordon, Christophe Boutin, one of the curators speaks with our group from the Miami Chapter of the AIA before we tour the fair. We have a special relationship with the UNTITLED Art fair in Miami. As their official art advisor, we work directly with VIPs and conduct tailored tours for collectors. 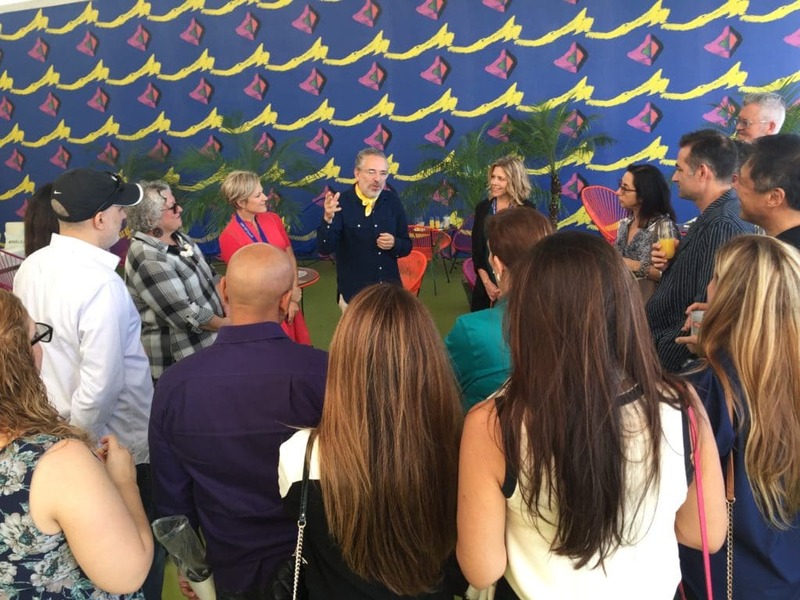 The tours are designed to provide deeper engagement with the exhibitors, and give collectors the opportunity to meet artists and dealers personally. 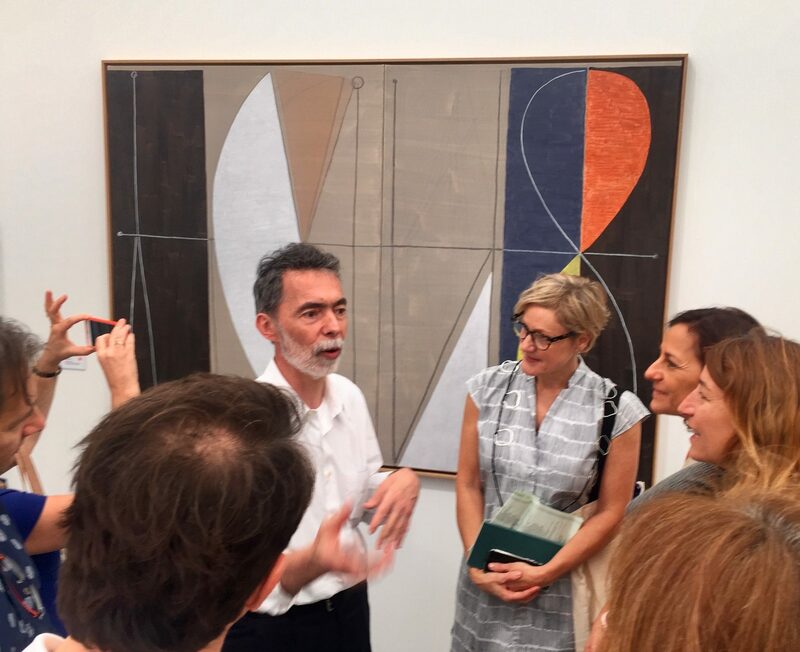 Andrew Holmquist describes his paintings to UNTITLED VIPs at Chicago based Carrie Secrist Gallery’s booth. 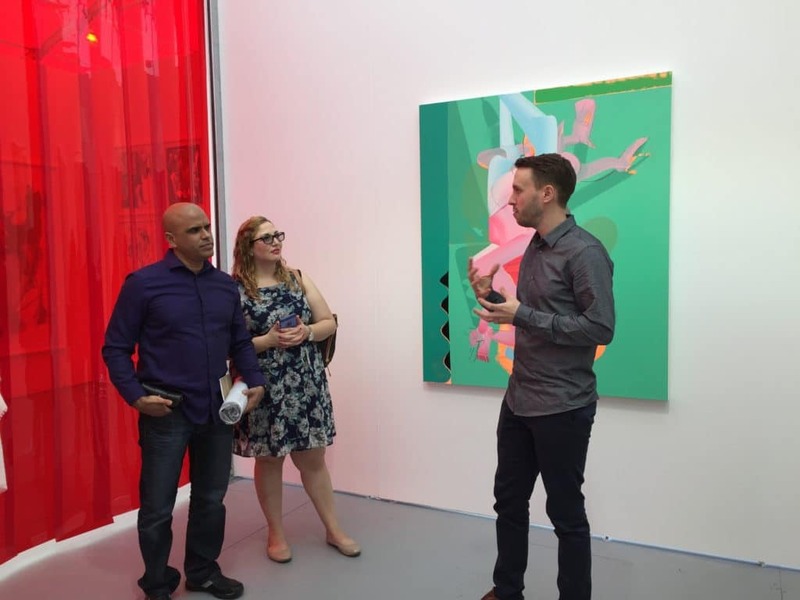 Artist Julio Villani speaks with our Harvard GSD alumni group about his art practice at Brazil’s Mercedes Viegas’ booth at UNTITLED, Miami. 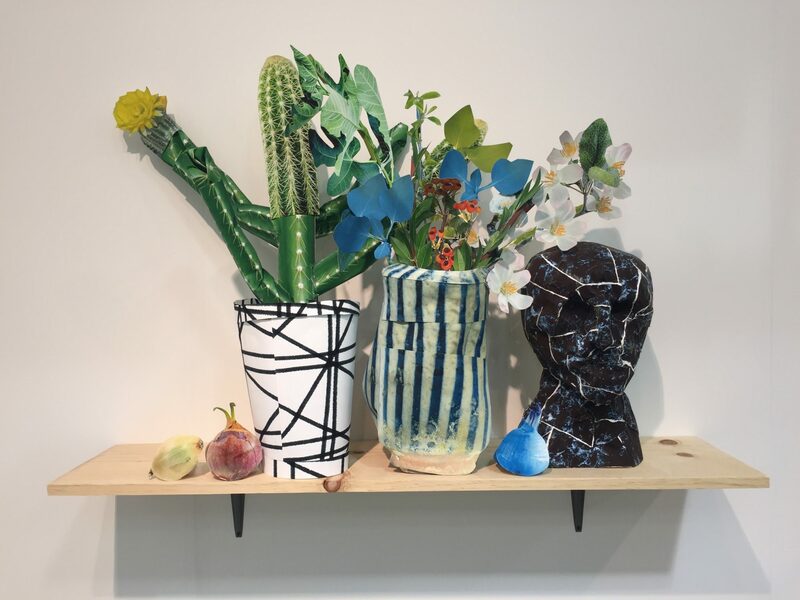 While we do significant research on what galleries are bringing to the fairs, discovering new work for our clients is one of the more important things we do in Miami and for that matter all year long. In Miami, we spend time at the five highest quality fairs where we focus on client’s needs and interests. Below is a sampling of both new discoveries as well as works that we have strategically placed in client’s collections. 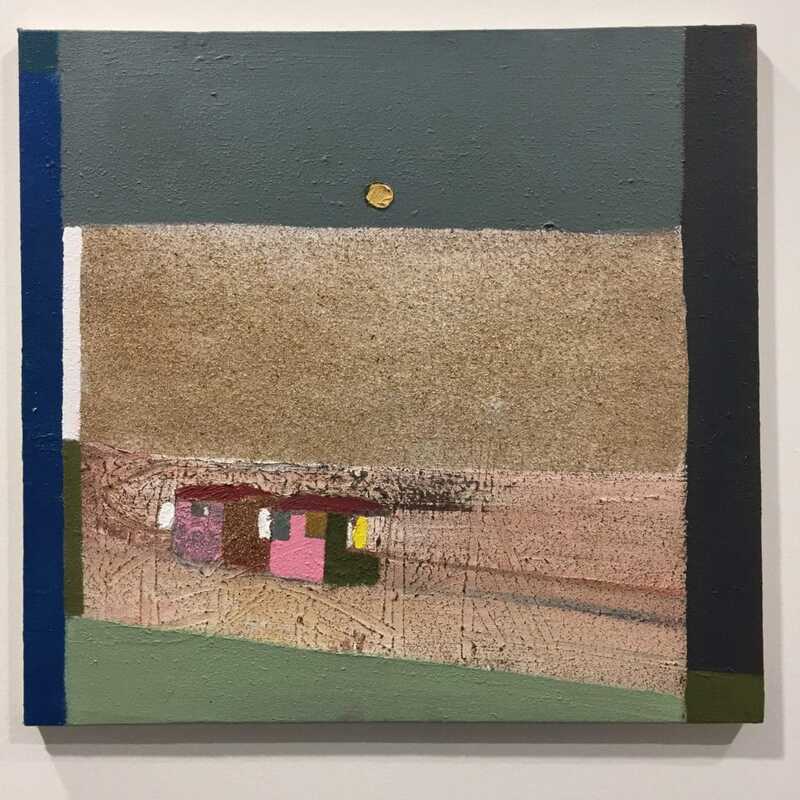 Merlin James “Beach Huts” at Sikkema Jenkins Gallery, Art Basel. While not very well known in the US, James represented his home country, Wales at the Venice Biennale last year. He has quietly been producing really solid work for years. 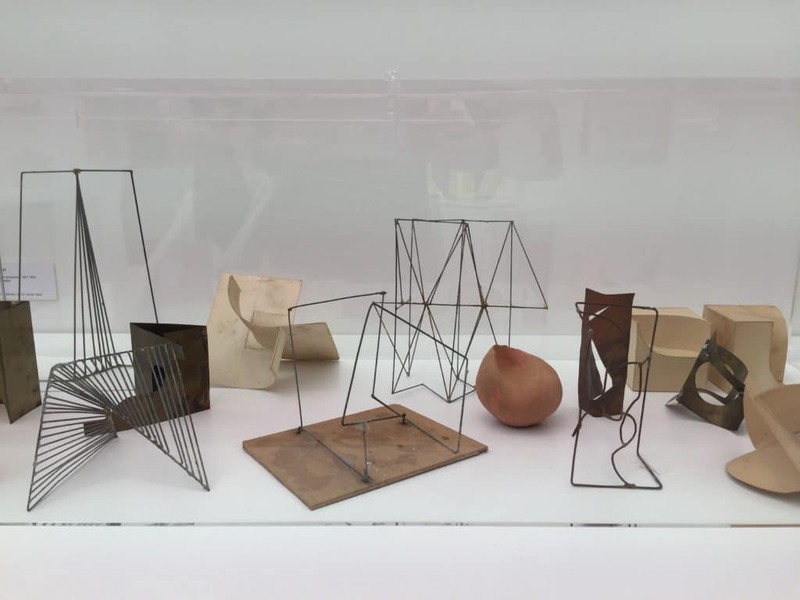 Equipo 57 “Models for Sculptures” 1957-1962 diverse media at Galeria Rafael Ortiz, UNTITLED. An extraordinary presentation of the elusive artist collaborative working in Spain for 5 years. Marc Horowitz at China Art Objects gallery at NADA. This work marks a return to painting for LA based Horowitz who is otherwise known as a social practice artist. 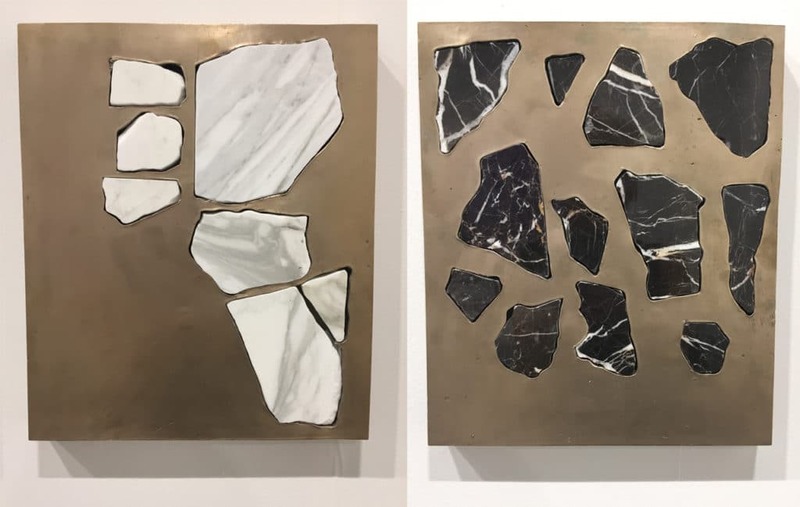 Sam Moyer “Untitled ” pieces in bronze and marble, at Rachel Uffner gallery, Art Basel. Moyer’s work inspired by architecture, blurs the line between various mediums including sculpture, photography, and painting. 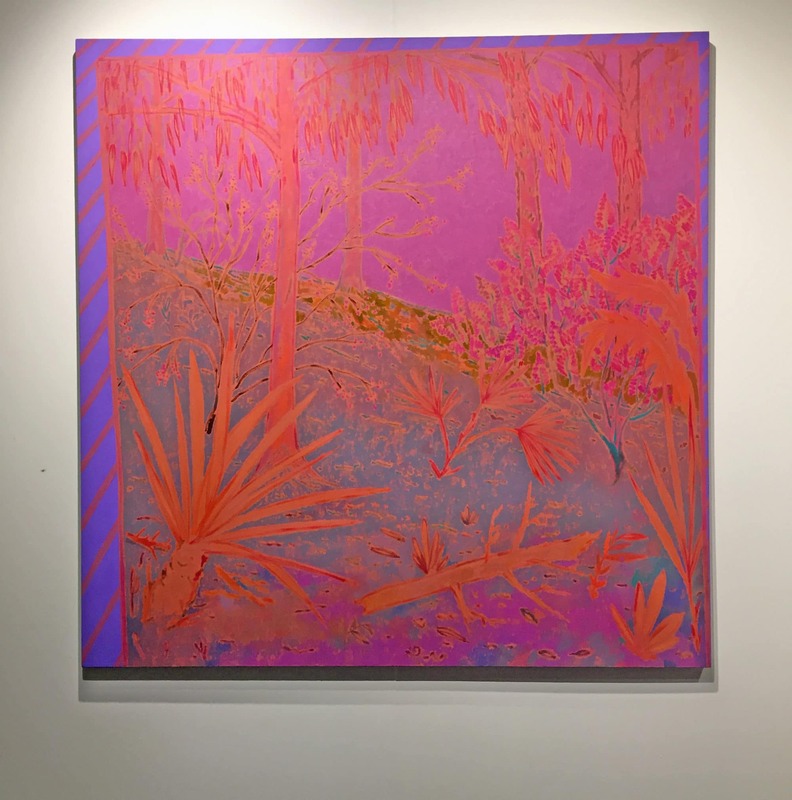 John McAllister’s intensely colored paintings inspired by old photographs of Bonnard’s studio was one of the more well received booths at James Fuentes Gallery, NADA. 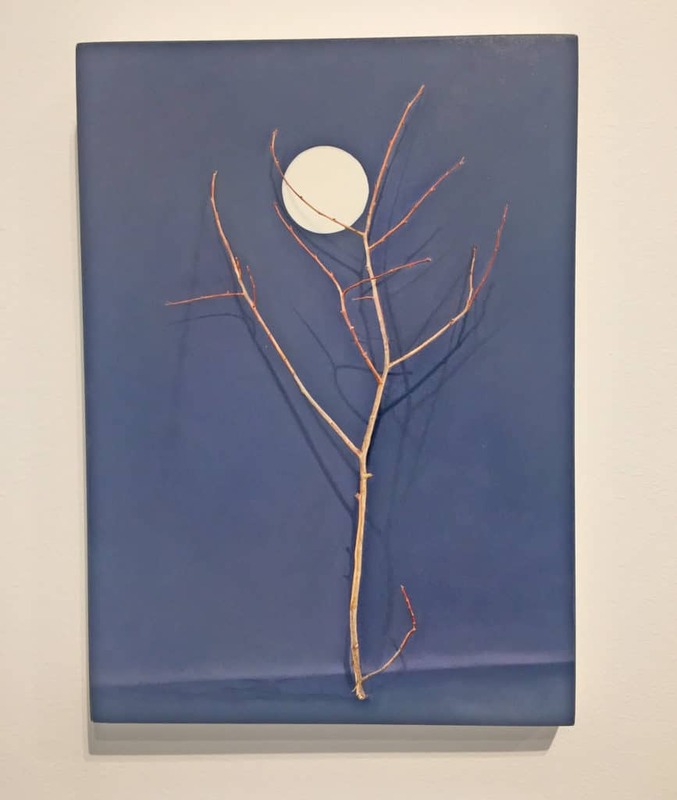 One Star Press owners Melanie Scarcilia and Christophe Boutin encouraged artist Gordon to ‘reveal’ the inner workings of his labor intensive still-life/photography process at their booth at UNTITLED. Michael Van Ofen “Nach E. D.” 2016 oil on linen based on the Eugene Delacroix painting shown on the right at Sies + Hoke gallery, Art Basel. Van Ofen uses minimal gestures to capture and convey old maters paintings. Claire Kerr “Tree with Cut-Out Moon” 2016, oil on gesso panel, Purdy Hicks Gallery at PULSE. Kerr, based in Dublin paints everyday and often peripheral things. The paintings are small scale, and the technique is almost photographic they are so precise. Olafur Elaisson, Tonya Bonakdar gallery, Art Basel. 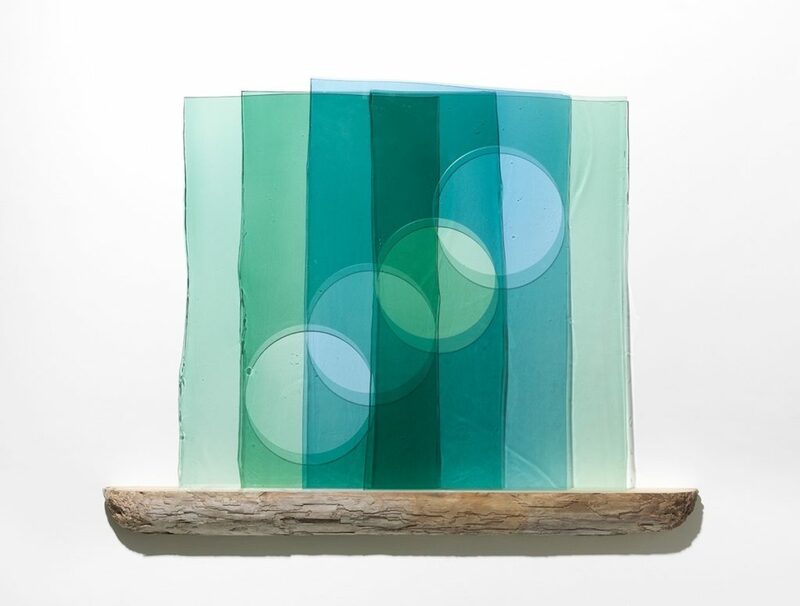 Eliasson’s hand-blown glass and drift wood work made with glacier dust speaks to current global issues. Ebony Patterson’s “… When They Grow Up” installation at Monique Meloche gallery, at UNTITLED. 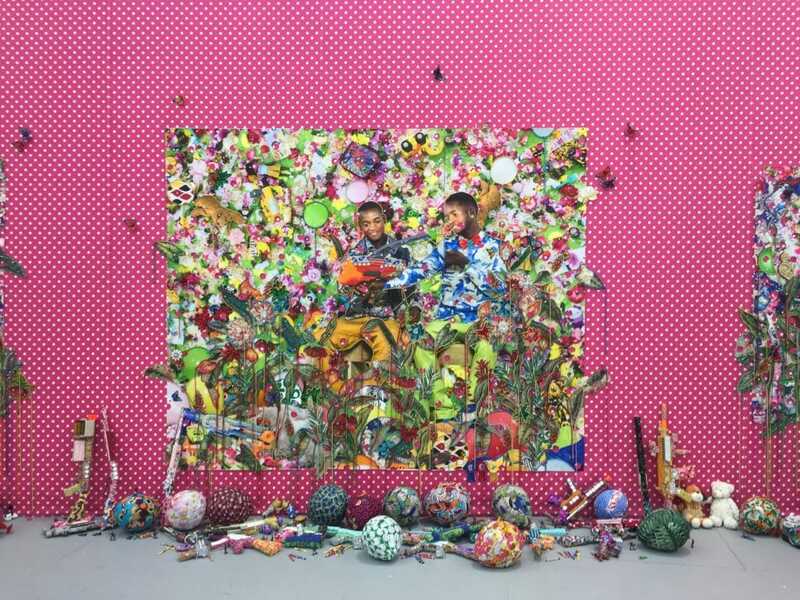 This installation, originally installed at The Studio Museum in Harlem, features fabric applied to the walls, appliques, beads, glitter toy cars, toy guns and digital prints on hand-cut matte photo paper. It is a powerful and complex response to the current wave of gun violence committed against young people of color. 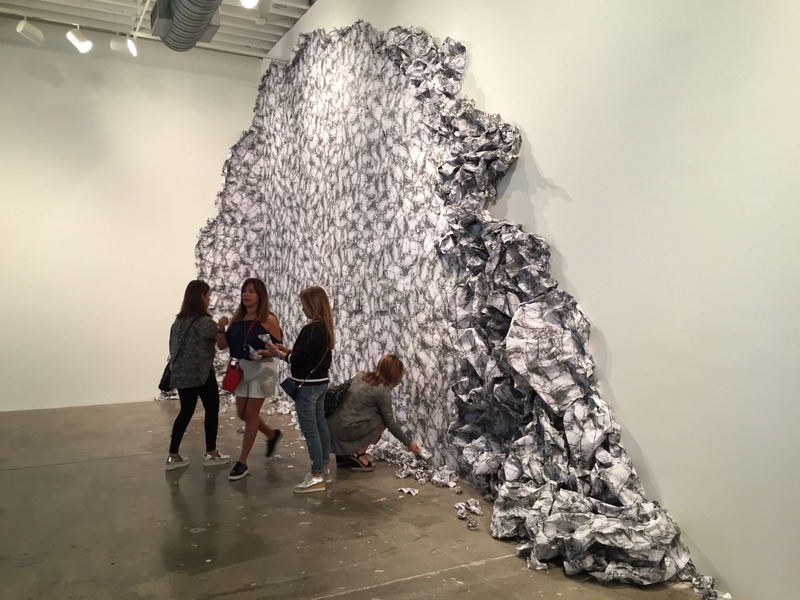 Beyond the art fairs, a broad range of vibrant art offerings such as private collections and museums display some of the most timely, relevant contemporary art in the world during Miami Art Week. Mark Dion’s new site-specific, permanent installation “David Fairchild: Laboratory at The Kampong,” is at The Kampong of the National Tropical Botanical Garden in the Coconut Grove neighborhood of Miami. A re-creation of famed horticulturalist David Fairchild’s laboratory, this project exposes Fairchild’s profound impact on American food culture and explores the Kampong’s history through the artist’s particular visual and material vocabulary. 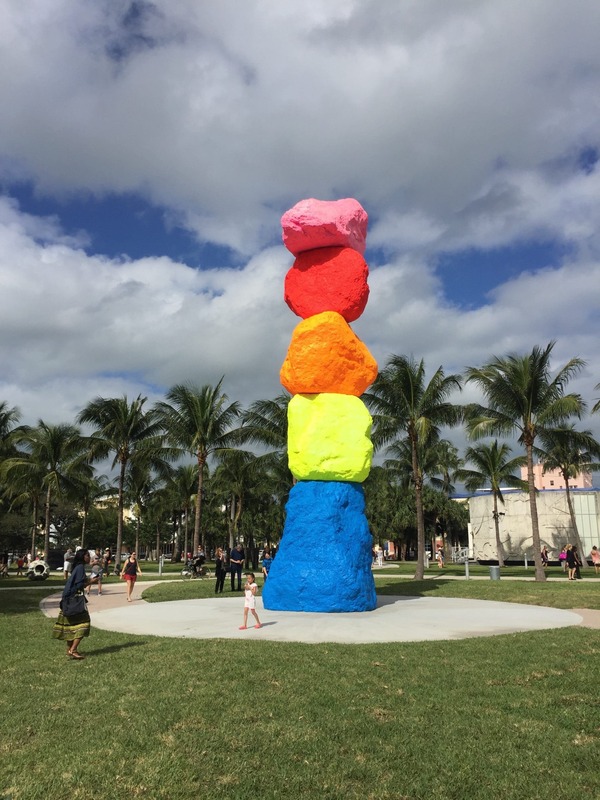 Ugo Rondinone “Miami Mountain” stone, paint, steel. Part of “Ground Control” in the Public Art sector of Art Basel. Miami Mountain consists of a five brightly painted boulders, stacked in the form of a contemporary cairn. Each boulder weighs between 15 an 30 tons. The piece finds its geological inspiration in the rock formations of the North American Badlands, the so-called ‘hoodoos’. The materials, at their core, are ancient and subjected to the sublime forces of time and nature, which is a recurring motif in Rondinone’s practice. His interest in what he calls ‘primitive materials’, such as boulders, stems from contemplation, stillness and inaction. Liliana Porter “Wrinkle Environment” 1969, offset prints on a wall, on objects and pads for viewers to tear off wrinkle and throw away. Liliana Porter recreated a new version of “Wrinkle Environment” especially for this year at CIFO Foundation. 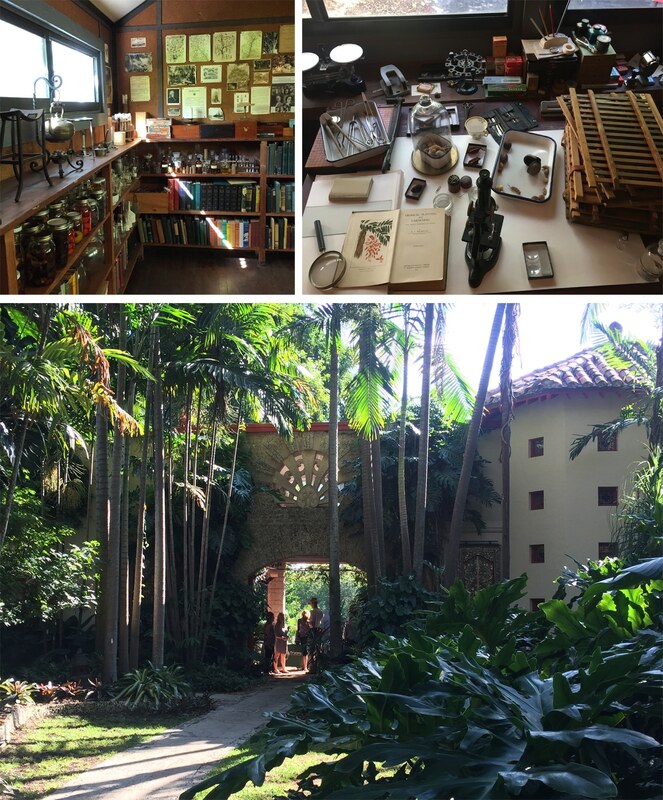 We always make a point of visiting CIFO, a non-profit foundation which houses Ella Fontanals-Cisnero’s collection. 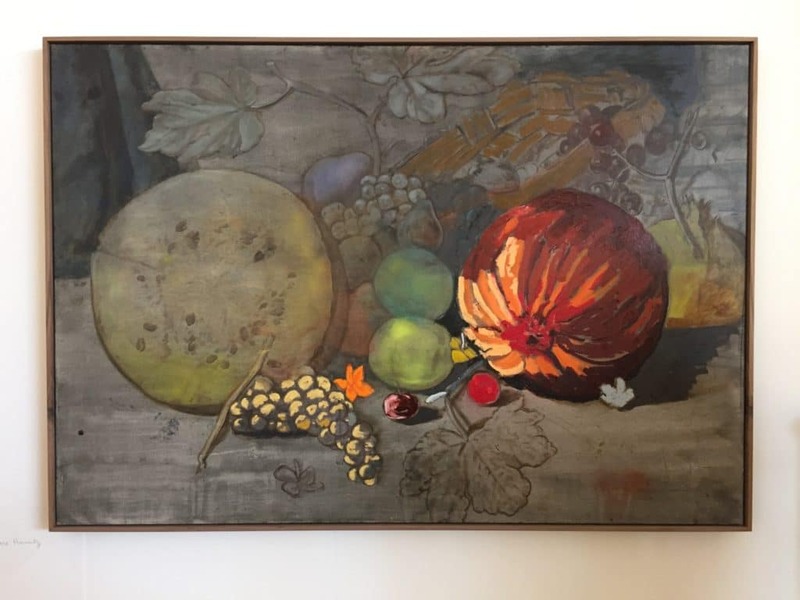 The recreation of this Liliana Porter piece is part of the current exhibit titled Toda Percepción es una Interpretación: You are part of it that showcases 39 artists and 49 works from the Ella Fontanals–Cisneros Collection. Anselm Kiefer “Sprache de Vogel” 1989 lead, steel, wood , oil, plaster, resin and acrylic. On view at The Marguilies Collection at the Warehouse. 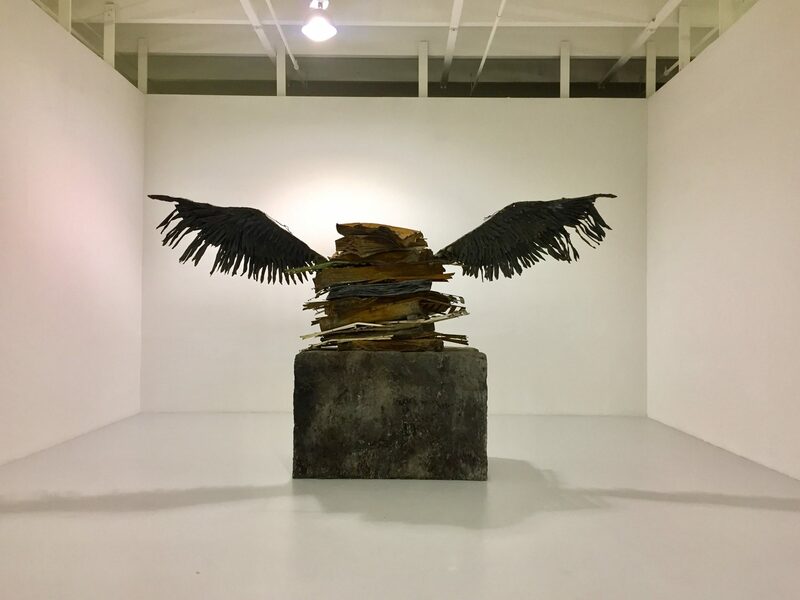 The titled of this three ton sculpture translates to Language of the Birds, which according to the 20th Century French alchemist, Fulcanelli, teaches “the mystery of things and unveils the most hidden of truths.” As with all Kiefer’s work, allusions are never literal but reflect an ongoing interest in systems – mystical and material – which have evolved over centuries. This piece is one of several recent Anselm Kiefer acquisitions on view at the Margulies Collection. As we continue to share with our clients our new discoveries in Miami we are also preparing for two very exciting fairs coming to San Francisco Jan 12 – 15. FOG Design+Art is a fair unique to San Francisco and brings important contemporary art galleries together with design galleries with the Vernissage benefitting SFMOMA. UNTITLED will open it’s inaugural San Francisco edition at Pier 70 and will feature 50 international galleries as well as special projects by Bay Area based arts organizations. The Bay Area is teeming with rich art offerings in the form of galleries, artist run spaces and institutions. Support our local community by getting out and visiting. Crystal Liu “Trying to Get There ‘A Good Night'” 2016, collage gouache, ink and watercolor on paper. Image courtesy Hosfelt Gallery. 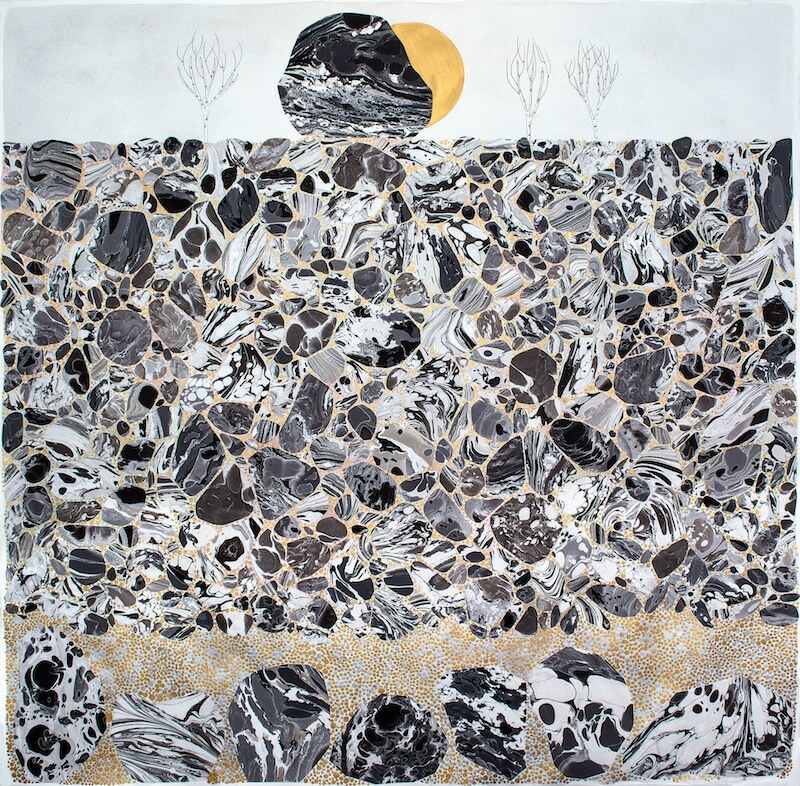 Saturday, December 10th, 4-6 pm – Opening reception for Crystal Liu: Waiting it Out at Hosfelt Gallery: Crystal Liu constructs landscapes that are metaphors for her emotional states. In large-scale paintings on paper that incorporate her adaptation of the technique of marbleized paper along with watercolor and metallic pigments, the fundamental elements of earth and sky enact narratives of conflict, entrapment, longing, and precarious hope. The exhibition runs from December 10th – January 21st. Hosfelt Gallery is located at 260 Utah Street in San Francisco. 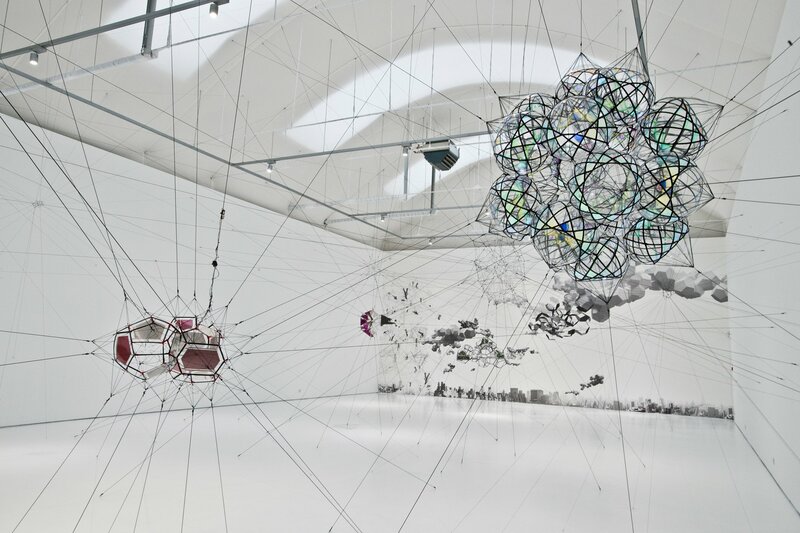 Tomas Saraceno “Many Moons and Words” 2016, installation view The Vanhaerents Art Collection. Image courtesy SFMOMA. December 17th to May 21st – Tomas Saraceno: Stillness in Motion – Cloud Cities at SFMOMA: Trained as an architect and visual artist, Saraceno’s research-based practice draws from scientific investigations into physics, biology, cosmology, and engineering. His work has deep sociological motives, with undercurrents of human interconnectivity and universal engagement in the pursuit and provocation of a utopian future. In Stillness in Motion — Cloud Cities, his visionary proposals for airborne cities build upon the artistic and architectural experimentation, forward-thinking radicalism, and progressive social change of the 1960s and 70s. 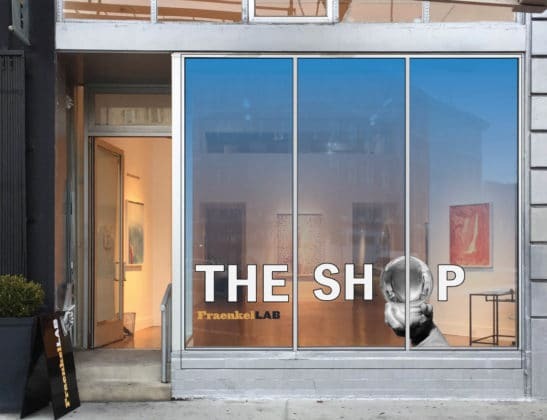 Image of the storefront of FraenkelLAB. Image courtesy Fraenkel Gallery. November 30th – December 24th – The Shop at FraenkelLAB: Fraenkel Gallery announces The Shop at FraenkelLAB, a four-week-only pop-up store featuring books, posters, limited editions, and special events. FraenkelLAB will partner with local collaborators The Thing Quarterly, The California Sunday Magazine, TBW Books, and Little Big Man Books to offer a diverse selection of artists’ books, prints and artist-designed objects. Visitors to The Shop can discover signed posters by Nan Goldin, Katy Grannan, Alec Soth, Richard Learoyd, and Adam Fuss, as well as favorite Fraenkel Gallery books. For art-lovers looking for particularly unique gifts, The Shop will offer a curated array of anonymous and vernacular photographs. The Shop will also feature limited-edition publications and artworks, including Lee Friedlander’s large-format book America by Car; beautifully-printed broadsides of poetry accompanied by Robert Adams’ photographs; and San Francisco Panoramas, 1878 and 1990, by Eadweard Muybridge and Mark Klett. FraenkelLAB is located at 1632 Market Street, and The Shop will be open Wednesday-Thursday 1-7pm; FridaySaturday 12-8pm; and Sunday 11am-3pm from November 30-December 23, with special hours on December 24 from 11am-6pm. 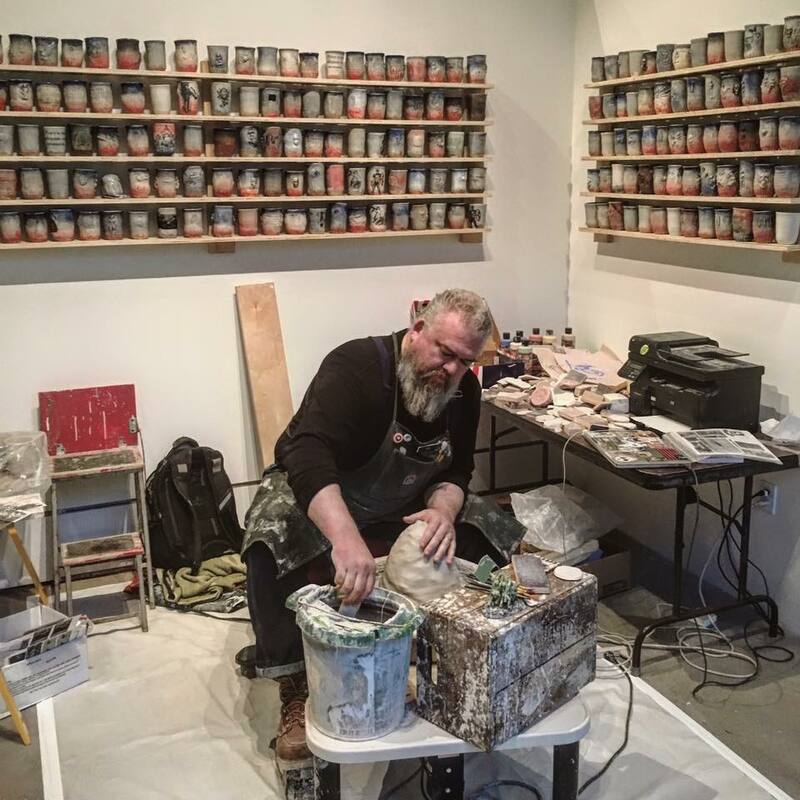 Veteran artist Ehren Tool crafts ceramic cups every Saturday during the exhibition. Image courtesy SFAC Galleries. Ongoing to March 4th, 2017 – Not Alone: Exploring Bonds Between and With Members of the Armed Forces at SFAC Galleries: This expansive exhibition features works by local and national artists and veteran artists that have been engaged with the subject matter of individuals supporting active-duty personnel and/or veterans over long periods of time. The artists in Not Alone engage in building narratives about and with members of the Armed Forces and their families through media including photography, drawings, prints, sculpture, audio works, installations and 360 video. Their works offer perspectives on a variety of topics including veteran support networks, the experience of spouses and children of US military personnel and how veterans examine their own identity and personal relationships. Veteran artist Ehren Tool will be in the gallery every Saturday making ceramic cups to give away. By crafting cups with military-related imagery, Tool hopes to inspire honest conversations about war. SFAC Galleries is located at 401 Van Ness Avenue.